(Virgin Records) Proceed with Caution. 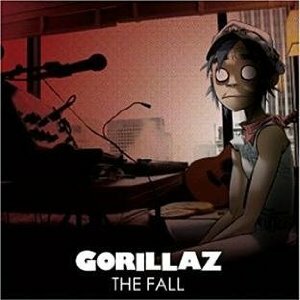 According to the Gorillaz, each album was a representation of a specific member’s musical style. The self titled debut showcased Russell’s hip-hop/funk roots. ‘Demon Days’ was a reflection of Noodle’s dark, doomy side, and ‘Plastic Beach’ was an exploration into the depths of Murdoc’s thoughts. 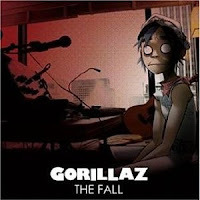 And, now, with The Fall it’s time for 2-D (aka Damon Albarn) to showcase his personal and distinctive vision. Conceived as the first “virtual hip-hop group” the Gorillaz are renowned for breaking new grounds musically, so it’s no surprise that this album was created during the band’s 19 date North American tour and recorded on an iPad in various hotels and venues with the aid of 20 apps. Essentially, it’s a sonic diary with each track being written in a day in a different state – hence titles such as “Phoner to Arizona,” “Detroit,” “The Snake in Dallas,” and “California and the Slipping of the Sun”. Unlike past releases there is only one guest vocalist, Bobby Womack, who is featured on “Bobby in Phoenix”. The album itself is very organic in nature, incorporating lots of computerized effects and mid-tempo beats. Vocals are sparse as most tracks are instrumentals. “HillBilly Man” starts off simple before kicking into a disjointed electronic beat. “Little Pink Plastic Bags” is an amusing little ditty that is a bit obscure but catchy none-the-less, and the ukulele in “Revolving Doors” adds a nice touch. A majority of the tunes are short little clips, (i.e. “Seattle Yodel,” which consists of about 30 seconds of yodeling.) and there are no big radio hits to be found. The Fall is definitely an artistic album that had no intentions of being a commercial success. Smoke some pot or do a little acid before listening and you’ll enjoy it a whole lot more. In essence, gadgets are purchased to help as a way to accompany these individuals having apparel. replica breitling watches today usually are accepted as a vital section of the gadgets in addition to the majority of people desire paying for this Fastrack. That is a corporation of which will keep as the primary goal this circumstances on the fresh The indian subcontinent in addition to dependant on of which rolex replica sale types in addition to produces the most beneficial wristwatches. Fastrack is defined as some sort of sub-contract brand of Titan and is also deemed as some sort of synonym towards concept vogue. That is a model that has a substantial a number of ghadiya intended for both equally adult males together with women of all ages to pick out the replica watches can certainly go to the web page on the corporation in addition to look at this wide variety readily available. The vast majority of adult males usually are hugely cognizant though choosing a completely new check out. Intended for adult males, replica cartier watches is not just a period of time featuring unit they desire using unique ghadia intended for unique functions like brand ghadia, sporty wristwatches, for example. Correctly, adult males desire using unique replica tag heuer watches for just a unique special occasion. Fastrack glasses intended for adult males employ a substantial a number of glasses from which this adult men can certainly pick out.